Last month, we announced that Drayson Racing would attempt an electric world land speed record in Britain. Yesterday, the car accomplished that goal, destroying the forty-year-old World Electric Land Speed Record by nearly thirty miles per hour. The old World Electric LSR was 175 mph, set back in 1974 by Battery Box General Electric. Yesterday, former UK science minister Lord Drayson got behind the wheel of his electric Le Mans Prototype, the Drayson B12 69/EV, and tromped the throttle. This resulted in a record-shattering run of 204.185 miles per hour (328.6 km/h), beating the former EV record by a solid 29.2 mph. "I’m delighted we’ve beaten the record tonight and can show the world EVs can be fast and reliable," said Lord Drayson after the run. 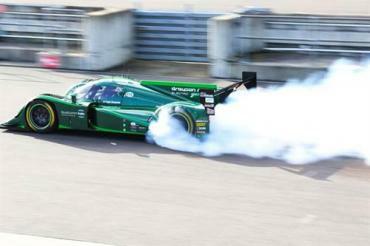 "Drayson Racing is a laboratory for EV technology, testing it to the most extreme level, as we’ve seen today. It is not the outright speed of 203 mph that is most impressive about this record, but the engineering challenge of accelerating a 1000kg electric vehicle on a short runway over a measured mile. However I’ve got a great team and world-class partners, such as QualcommHalo, Michelin, Multimatic and Cosworth. This is a true celebration of Britain’s leading position within the burgeoning electric vehicle industry and I’m delighted to be at the forefront of this electric revolution. We hope to set more records tomorrow." Drayson continues to work on the record books and is currently powering the Drayson B12 69/EV formula car through the EV acceleration record. Once the FIA records are confirmed and announced, there will be official numbers on the records that have been broken and set. Unofficial numbers, however, are so far past the old records that it's clear the race car and its storied driver have put themselves in the record books and will likely remain there for a long time. It is expected that FIA will release official numbers for the record runs sometime next month. It's unclear where Drayson will go from here, but it's very likely that wherever they do go, it will involve more record-setting and history-making showings for what is likely the world's most prominent and successful electric motorsports team.